Sonapur : If somebody had said that money doesn’t grow on trees, you will say he must be lying – after you meet Hareswar Deka of Upper Tepesia village in Sonapur area, some 35 km from Guwahati, in Kamrup district. A retired state government official, Deka has proved by dint of his intelligence and hard work that money indeed grows on trees. And his money now grows on his rubber trees. Deka has set an example how economic progress can be achieved in rural areas of the state through rubber plantations in a systematic way. “I’m quite satisfied now with the money I’m getting from my trees and would urge people to do the same, if they really want a handsome return. It’s definitely one of the best ways for economic progress,” an elated Deka told Seven Sisters Post at his residence. And not without reason – with a mere return of Rs45,000 in 1996, his earning from rubber soared to Rs14,77,000 last year. His experimentation with rubber started in 1986 when he planted 450 saplings on a plot of land measuring one hectare. “I had a horticulture garden with various species of fruits, but as I was away most of the time due to my official engagements, some people used to destroy them. Hence I decided not to plant any fruit there. During that time, I came across a newspaper article which narrated the benefits of rubber plantation, and I immediately went to the Rubber Board office in Guwahati,” he said. And there was no turning back. 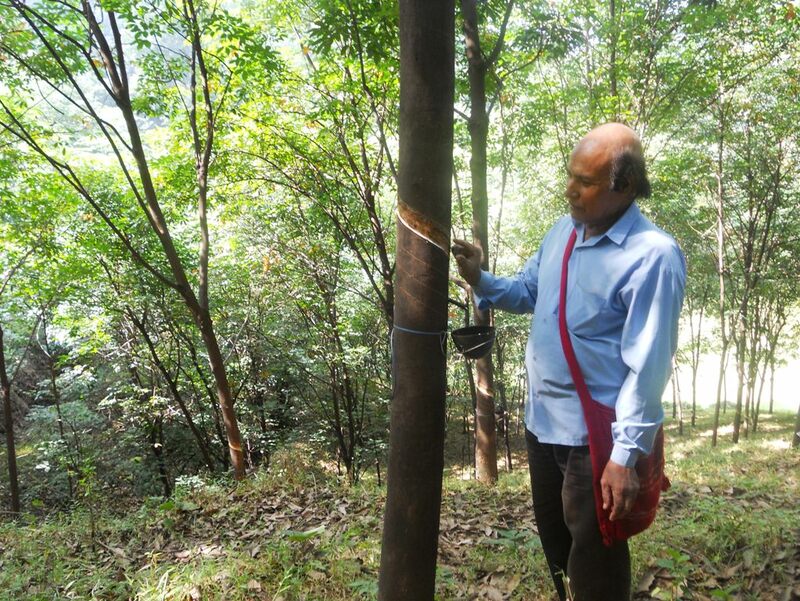 Now, along with his son Debajyoti, Deka’s rubber plantation covers an area of almost 14 hectares. At present, the father son duo is selling raw rubber around Rs180 per kg either to the Rubber Board or any private party, depending on the international market. The Dekas said that in 2010 the price had jumped to Rs215 per kg. A full-grown tree gives up to 250 gram of rubber liquid per day. And, depending on the weather, they thus collect around two tonnes of liquid per month from one hectare of land. And this continues for almost nine months of the year. Around four litres of liquids can give 1 kg of rubber after processing – sun drying and smoke drying. “But one has to be very careful while tapping the tree. We have to keep in mind that the tree does not get hurt. 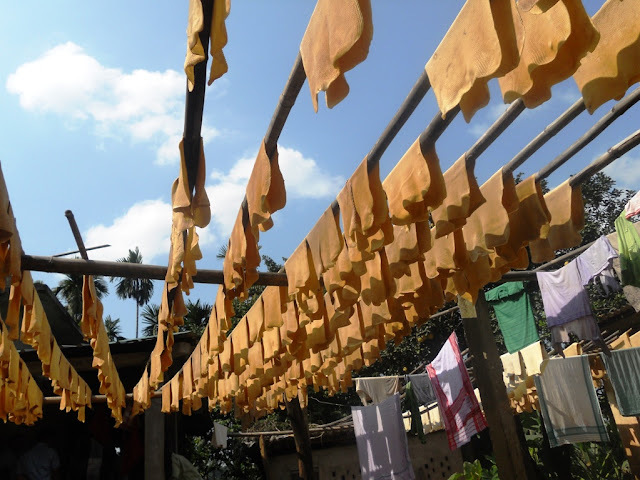 We collect the liquids every alternate day or after two days so that there is no pressure on the tree,” added the senior Deka, who even went to Kerala to study rubber plantation in 1997 with the help of the Rubber Board. The Dekas have employed seven unemployed youths. 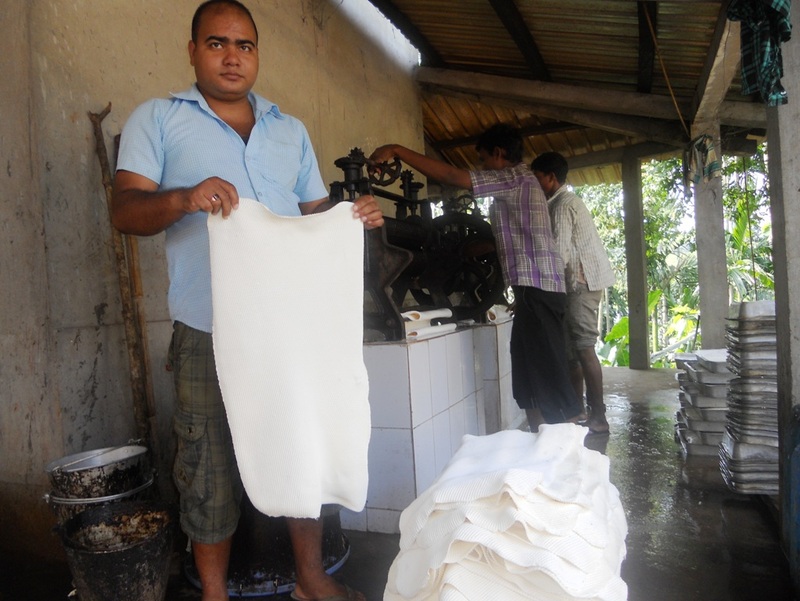 Now, seeing their prosperity and hoping to repeat their success story, other villagers too have evinced keen interest in rubber plantation, and some of them have already started the cash crop cultivation. Among them is Debeswar Pradhan, son of a farmer, who has started rubber plantation on his own with the help of World Vision India, an NGO that offered him 300 saplings. He has planted these on one hectare plot of land and nurturing another 350 saplings. Inspiring news for all of us.